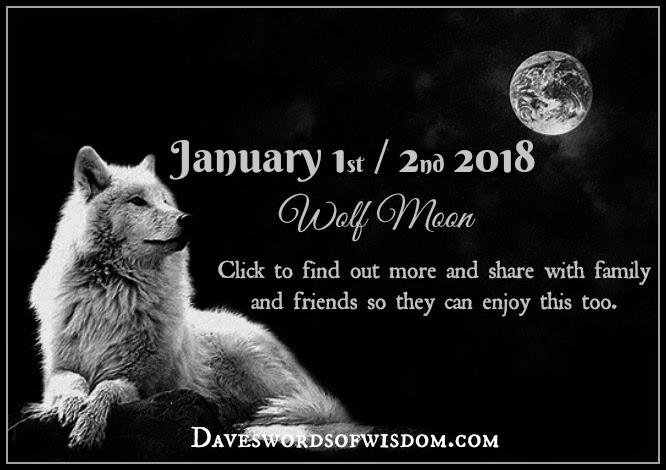 The Wolf Moon on the night between 1 and 2 January 2018 is a Supermoon. The first full moon of January will be on New Year's Day. For viewers in New York, it will occur at 9:24 p.m. local time; in the U.K., observers will see it at 2:24 a.m. local time, and in Hawaii, it will be at 4:24 p.m. local time (so the moon will be a touch past full when it rises at 6:06 p.m.). Not every place on Earth will see the Blue Moon this month, because the second full moon of January won't technically appear in those places until Feb. 1. These places include regions in eastern Asia and eastern Australia, where moon watchers won't see the first full moon until Jan. 2 and the next full moon until the morning of Feb. 1. For example, in Melbourne, Australia, the full moon arrives on Jan. 2 at 1:24 p.m. local time, and the next full moon is on Feb. 1 at 1:26 a.m., so moon watchers will technically miss the Blue Moon by less than 2 hours. But their fellow Aussies in Perth, in the southwestern part of the country, will get one, since the first full moon occurs on Jan. 2 at 10:24 a.m. local time, so the moon will still look quite full when it rises at 7:35 p.m.
On Jan. 31, the moon rises at 7:09 p.m. and reaches fullness at 9:26 p.m. Blue Moons are not as rare as the old saying "once in a blue moon" implies; they happen about once every 2.7 years, because the number of days in a lunation (new moon to new moon) is a bit less than the usual calendar month — 29.53 days as opposed to 31 or 30 days (except for February, which has 28 days, so a blue moon cannot occur). A sequence of 12 lunations adds up to 354.36 days, against the 365.24 days in a year. The discrepancy adds up over time, until a year will have 13 lunations as opposed to 12. For some observers, 2018 will feature two Blue Moons — one in January and one in March (with no full moon in February). Today, we use many of these ancient month names as Full Moon names. A common explanation is that Colonial Americans adopted many of the Native American names and incorporated them into the modern calendar. However, it seems that it is a combination of Native American, Anglo-Saxon, and Germanic month names which gave birth to the names commonly used for the Full Moon today. Some years have 13 Full Moons, which makes one of them a Blue Moon, as it doesn't quite fit in with the traditional Full Moon naming system. However, this is not the only definition of a Blue Moon. While the almanac states that Wolf Moon is a Native American name, other sources claim that it has Anglo-Saxon origins. In Anglo-Saxon culture, the January Full Moon was also called the Moon after Yule, which is the time of the ancient festival celebrating the Winter Solstice around December 22. During the denning season in spring and early summer, wolves only howl to pack mates. As the late summer moves towards fall, wolves call more and more to neighbors and enemies. While an average howl from a single wolf lasts from 3 to 7 seconds, a chorus by a pack can last from 30 to 120 seconds and longer during the breeding season in February. So wolves are particularly loud and vocal in the first months of the year, which is probably why people associated the month of January with howling wolves. Do Wolves Howl at the Moon? The scientific community has no indication that the Moon phase plays any particular part in the calls of the wolf, but wolves are nocturnal animals, so they are in general more active at night. And wolves do howl in the direction of the Moon; they point their faces toward the sky for better acoustics, because projecting their howl upward carries the sound farther.